Tyler Malek of Salt & Straw may not be your traditional chef, yet his culinary influence can definitely be felt nationwide. Head ice cream maker of the Portland based ice cream parlor, Malek, alongside his cousin Kim, began Salt & Straw in 2011. After a successful stint operating out of a food cart, Salt & Straw now has four locations, including a newly opened Los Angeles shop, as well as have their products sold in countless more retail and restaurant operations throughout the West Coast. 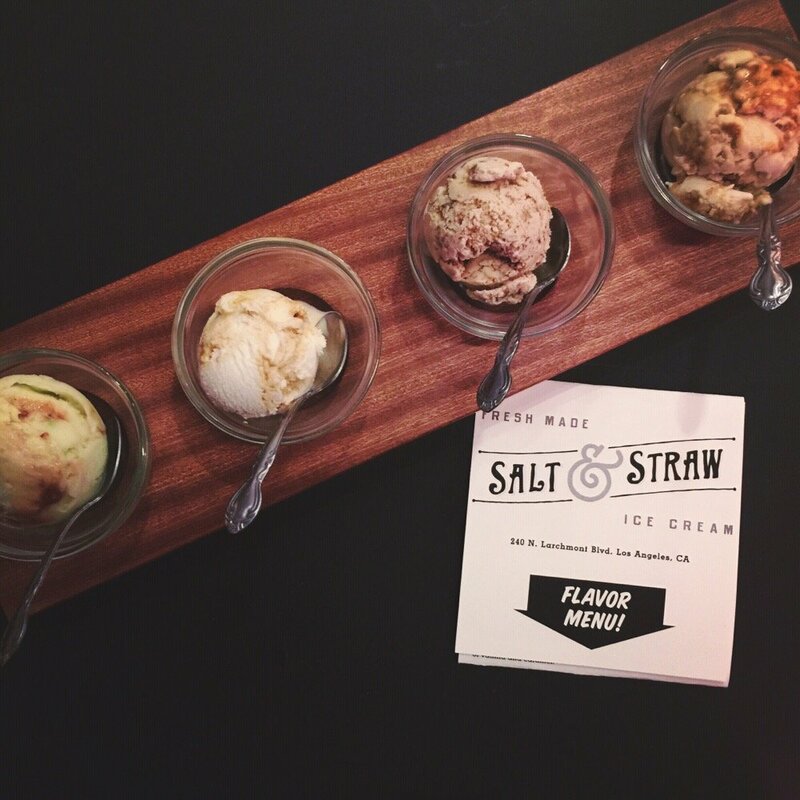 Over the last five years, Salt & Straw has been delighting patrons with their inventive, culinary inspired ice cream flavors, such as Honey Lavender, Pear and Blue Cheese, and Avocado and Strawberry Sherbet. In addition to these in-house standards, Malek also features a number of thematic flavors that change seasonally. such as current holiday favorites like Butter Roasted Chestnut, Peppermint Cocoa, and Mincemeat Pie. Yet more significantly, Malek has also been instrumental in bringing about a nationwide farm-to-cone awareness inspiring ice cream makers and pastry chefs across the country to follow in his foot steps of using hyper-local and seasonal ingredients in his over 130 different flavors. Just this year, the 27 year old Malek was named to Forbes '30 Under 30' list in the magazine's Food and Drink section for his work in the creamery. Below, we ask the chef six quick questions. Ice Cream Flight | Yelp, Grace W.
Tyler Malek: When I was ten I spent the summer with my grandparents in Valier, Montana (aka my cheap dad's idea of summer camp). After tactful pleading with my grandma for creative control of her oven, she let me build the most epic cheesecake of my life. Imagine, twenty pounds; filled to the brim with baked and sugared cream cheese, loaded with fruits cut in the shape of flowers and a plethora of homemade jams. It was completely over the top and took us two weeks to eat but, to this day, one of the best things I've ever made. TM: Very tough... I love this trend towards these "supper clubs" because hanging out and cooking for my friends and family is pretty much the best thing in the world. TM: Yum, I love eating at Burgerville here in Portland. They have worked so hard on building a business that takes care of the food community and farmers around them. They also have pretty bomb.com fish n' chips. Foodable: What's the most important lesson you learned (good or bad) in your first year of running a restaurant?